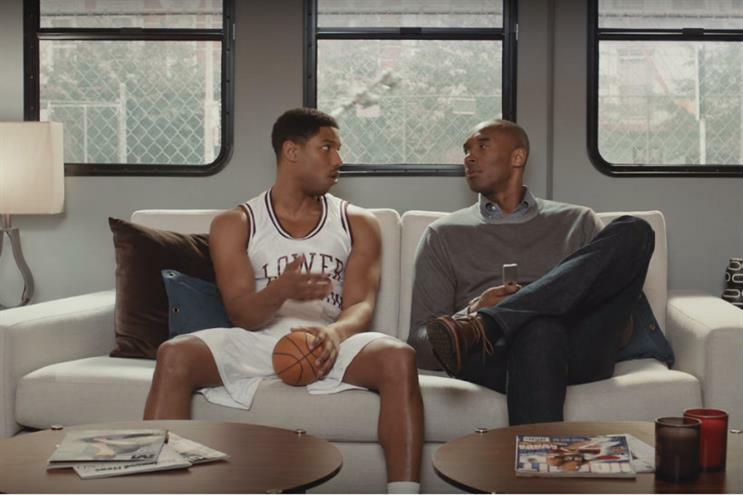 Apple's basketball references are usually lost on its non-US audience, but it's latest Apple TV spot with NBA star Kobe Bryant is universally funny. The spot sees Bryant hanging out in his trailer with actor Michael B. Jordan, who is purportedly about to play him in an upcoming biopic. Bryant shows the younger actor clips of his early career by getting Siri to open the NBA app on his Apple TV. "See that?" Bryant tells Jordan, as the pair watch the player in his prime. "That's the guy you're playing in this movie." But 29-year-old Jordan says he'll be playing Bryant all the way through, likening his role to The Curious Case of Benjamin Button, partly in refernece to Bryant's upcoming retirement. The spot follows a string of ads featuring celebrities, including a Taylor Swift clip for Apple Music, and the Cookie Monster for an iPhone 6s outtakes film.